This new book explores the histories of individual flint glassworks in Scotland from the 18th to the 21st century, when Scottish glass production was flourishing. Major works in Glasgow, Edinburgh and Leith are looked at in detail, while other smaller, virtually unknown, producers like the Clyde Flint Glass Company in Greenock are also covered. This excerpt introduces some of the book’s main themes and identifies some of the key moments, and trends, in Scottish glass manufacture through the ages. Glass is easily ignored. We look through it, drink from it, admire our reflection in it, adjust our lenses and take it for granted. It’s just there. But when the Edinburgh Crystal chemist described glass to me as eighty percent chemistry and twenty percent magic, I realised there is a lot to discover. 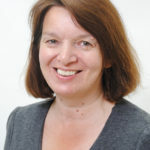 This short article will try to demonstrate the sort of insights obtainable from material such as recipes in an archive, legal documents in the National Records of Scotland, old newspapers and personal stories covering a period of over 170 years, which illustrate a little of the magic and some of the work which goes into creating glass. 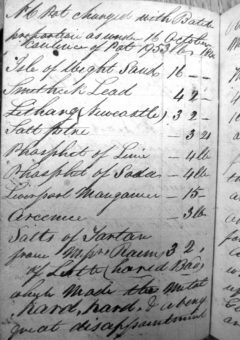 Researching the post-1750 history of Scottish glassworks involved all the usual sources: Court of Session papers, sasines, registers of deeds, estate papers, newspapers, facts and figures. But in the Museum of Edinburgh is the Ford-Ranken collection, a treasure trove of material from the 94 years of the Holyrood glassworks, including design drawings, vital to the identification of Scottish glass, and recipes, which show how difficult it can be to make the magic work. Manufacturers made what sold, so when fashion dictated that coloured glass was in vogue, the Holyrood glassworks quickly followed suit. 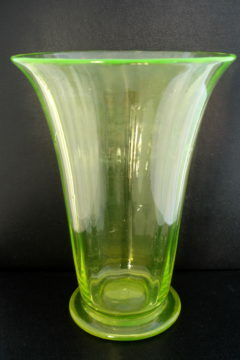 One early venture was the production of uranium glass, called canary or topaz. In May 1841, pot number one (of eight) in the furnace was charged with 545lbs of their clear ‘flint’ (lead) glass to which 6lbs of ‘oxide of uranium’ was added. It ‘turned out very good’. The same colour was made at Edinburgh Crystal 100 years later, one of its attributes being that it changes colour in ultra violet light. The mixtures did not always work so well. Even a standard batch (materials mixed and prepared for melting), could be spoilt by one minor ingredient, as a note on a recipe in 1840 makes clear, blaming salts of tartar from a local supplier for the glass turning out ‘hard, hard, & a very great disappointment’. Numerous experimental recipes are noted in the archives and it becomes clear that sometimes it was like using up the left-overs in the fridge and adding other ingredients, hoping the results are good. In 1843 the furnace was shut down for a month for rebuilding and when it restarted pot number one was charged with 432lbs of green cullet (waste glass, ground down before remelting), 116lbs of soda batch, 2lbs ‘oxide of copper’ and 12lbs bichromate of iron, the result being a ‘remarkable good grass green’. The contents of the pots changed constantly, the results of each being noted. The most popular colour between February 1860 and October 1863 was green, followed by opal (which was used for lighting). Blue, purple and red came next with ruby the least commonly produced. A number of letters and recipes make it clear why that was the case, since it involved the expensive use of gold in the batch and was very difficult to get right. One particularly magical example was the description of how gold ruby could appear to be clear, but over a period of up to eight weeks, it slowly turned red. Even the most commonly used recipes could fail if the ingredients were faulty; too much iron in the sand gives glass a green tinge, fine for bottles, not for decanters. 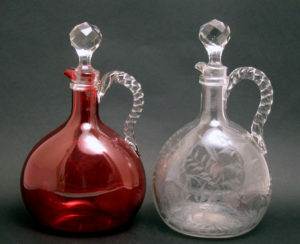 An important order for an American shipping company was lost when the glassworks ‘could not find out any possible way … to get the decanters free from the white cloudes which the glass was so much impregnant with’. Whatever was being produced – bottles, windows or table glass – the batch had to be melted at temperatures around 1400 degrees centigrade. And that is where the pots – or crucibles – came in. They were filled up on a Friday with a fresh batch of ingredients which melted over the weekend so that work could start on Monday. They were vital to production, difficult and time-consuming to make, lasted only a limited time, and, like most of the glassmaking equipment, had changed little over the centuries. Molten glass is corrosive and eats away at the clay pots; the clay has to be iron free or it contaminates the glass and even in 2004 it was impossible to predict how long a pot would last – in the final weeks of operation at Edinburgh Crystal, one lasted 20 weeks, its replacement just five days. The pot-setting process (removal and replacement of a damaged pot) was described in the ‘Scotsman’ in 1868 as ’about the most trying operation than men could be called on to perform’. Then, and in earlier centuries, every employee’s contract bound him to take part in the process, which involved opening up the furnace, removing the damaged pot on a two-wheeled iron trolley, cleaning the floor of the furnace with a long pointed iron tool, then placing the new pot, heated for at least five days, in the furnace, and replacing the firebricks before cementing them in. All carried out in the face of extreme heat because the fire in the furnace was never allowed to go out unless it required repair. 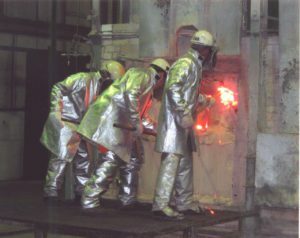 In 2004 the men wore full protective clothing and lifted the hot pots, designed to hold a ton of molten glass, on a fork-lift truck, taking roughly 45 minutes to complete the process. Before 1970 the men at Edinburgh Crystal had to buy second-hand clothing to protect themselves, put wet towels round their heads and carry out the hot, dangerous and exhausting operation manoeuvring iron trolleys like those used in the 18th century and earlier. It could take as long as four hours to complete the task. Gaining insight into the magic and misery that goes into creating the substance we use so much and appreciate so little, was one of the many pleasures in researching From Goblets to Gaslights. From Goblets to Gaslights: The Scottish Glass Industry 1750-2006 by Jill Turnbull is out now, published by the Society of Antiquaries of Scotland priced £50. An alternative name for lead glass.